Hadley Rille on the southeast edge of Mare Imbrium. A rille is a long, narrow furrow, usually with steep sides and sometimes meandering (known as a sinuous rille), formed either as an open channel in a lava flow, or as an underground tube carrying hot lava that collapsed as the lava flowed out. 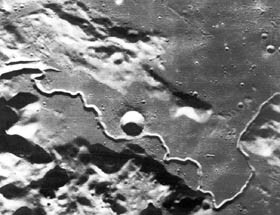 Rilles up to several hundred kilometers long and 1 to 2 kilometers wide are common on the Moon and on the surface of several other moons and planets in the solar system.